I’ve also nettled my fingertips through thin gloves. Typing makes them fizz. Must get replacement rigger gloves for my nettle foraging – I got one back today, which had been buried in Ann’s compost heap. Mebbe Mr Fox will let me have the other one back too. Probably just after I’ve bought a new pair. Tonight was quite busy. I planted out the comfrey next to the quince, gathered nettles for the dalek, picked many many purple beans as ‘gifts’ for friends, cut the haulms off the Desirees, tidied the squashes some more and fretted over a sick cucumber. 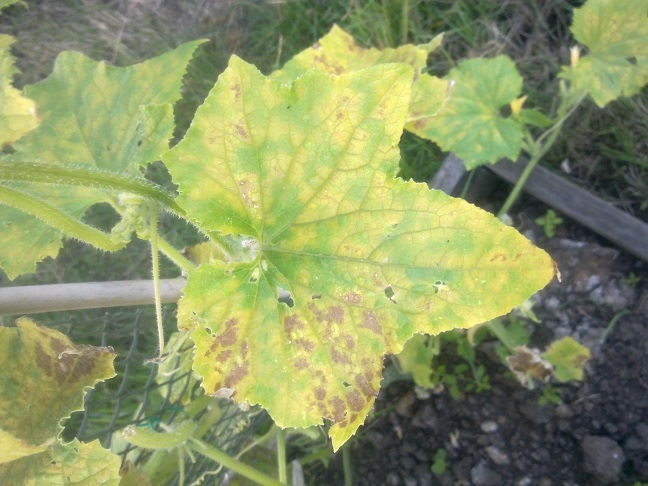 (pic of leaf here, which I will now be comparing with various pictures of diseased cukes via Gurgle – oh the giddy heights of my Tuesday nights!) Also weeded half the broccoli bed (using my new kneeler from Mum, instead of the normal half-empty compost bag) and took some of the leaves home to have for dinner with a lemon chilli, garlic marble, some tomatoes and onion. Topped with a bit of flinty cheddar, it was really very tasty. Oh, and I watered. A lot. And admired my squashes. I think one that was labelled a BNS might actually be a Thelma Sanders. 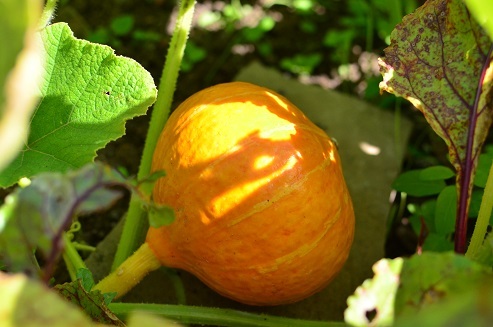 It is really pretty: sadly there’s only one squash on the vine. 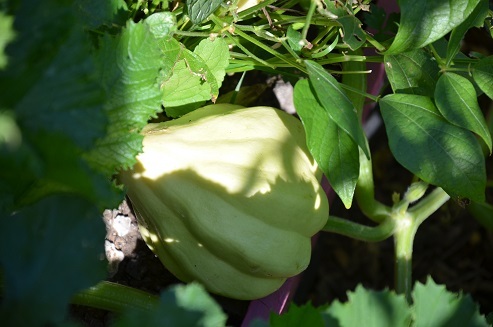 When I cut some chicoria for Piero’s dinner I found a tiny green potimarron – it’s very cute and I hope that there is time for it to come to something….that will mean this year’s squash harvest total will be 7!! More than double last year’s effort, and all new kinds. I now wish I’d entered the online pumpkin compy instead of the sunflower one. D’oh. Lovely Lionel’s back from holidays, and I palmed off donated some purple beans, and managed to ward off the gift of cucumber in return. Result! I already have 5 huge gherkins and 4 cukes in my fridge, they don’t need company! 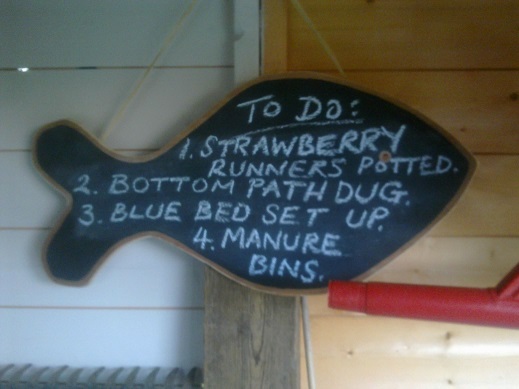 I also updated the Task Fish, who lives in the shed. Just to highlight that there is a bit of planning going on, if only a teeny bit!